The River Townhouse in Interlaken is a comfortable house with 6 large bedrooms. 4 double rooms are located on the main floor, 2 large rooms on the first floor. There is a extra room in the basement ( there is a window) and will be used for extra beds. The flower garden with its pond and goldfish is very large. The garden is completely closed there is no view from outside. In the garden there is an additional sitting area, large dining table and long chairs. Your kids can play in the garden or even outside on the street. There isn't hardly any traffic. They can play and taste what Swiss kids are doing. Depending the season you also have cows or sheep around the house on the pasture. The price that is showing is for 9-14 people. If you are less please contact us and ask for an offer. In addition to the RiverTownhouse i'm renting 2 apartments, located downtown Interlaken. They have been renovated this spring. I hope that i can accomodate larger groups of tourist by having all these options within walking distance. At the center of Interlaken i'm renting 3 more apartments, 2 apartments for 6-8 people, 1 apartment for 4-6. These are located in the same building and they also have a great terrasse on the roof with a wonderful vieuw. Please ask an offer. The house gives you rest and peace, a lot of space and comfort. 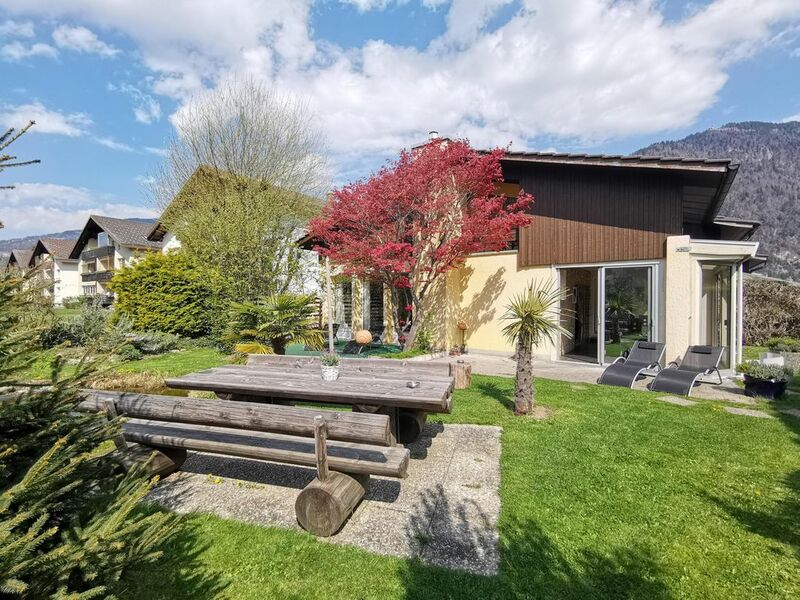 You life in the countryside, there isn't hardly any traffic and at the same time you are in walking distance from the center of Interlaken, train station, shopping and food stores, Restaurants. The house is great for larger groups. They will find enough space to feel good, relax and spent good times. Children will love it, they can play in the garden as well as outside around the house. The garden is completly closed, no view from outside. There is a pond with goldfish as well. All beds are ready upon arrival. Linen will only be changed after 7 days. Large garden with pond and goldfish, table, seating area, whirlpool, longchairs No view from outside, completly closed. Entrance true garden door or house. Only 3km from the house away is a beautiful 18 whole golfcourse. Excellent location, beautiful house, extremely well organized and thought through about all aspects. One of the best homes we stayed. Angela and Sybilla have done an excellent job of thinking through all aspects that family normally needs. It felt completely at home away from home. I would highly recommend this property. You cannot go wrong so rent it and have fun close to town, train, activities, shops etc. We had a great time in Interlaken. Thank you Angela and Sybilla. I will certainly rent again your proprry again in future. Thanks a lot for your compliments. Indeed, we always try to make our guest feel as comfortable as if they were staying in their home. Would be great having you again as my guest. Please book a couple of month in advance because i do have more and more domand. You can also book directly by contacting me over my website: www.immotwister.ch. See you soon and sunny greetings from Interlaken. From Interlaken West Station it takes you to the Jungfrau Joch / Top of Europe. The house is only 5 minutes away from downtown Interlaken. At the house there is no through traffic. From the house they reach the most beautiful walking paths in the region, the Aare or ship canal to Lake Thun.